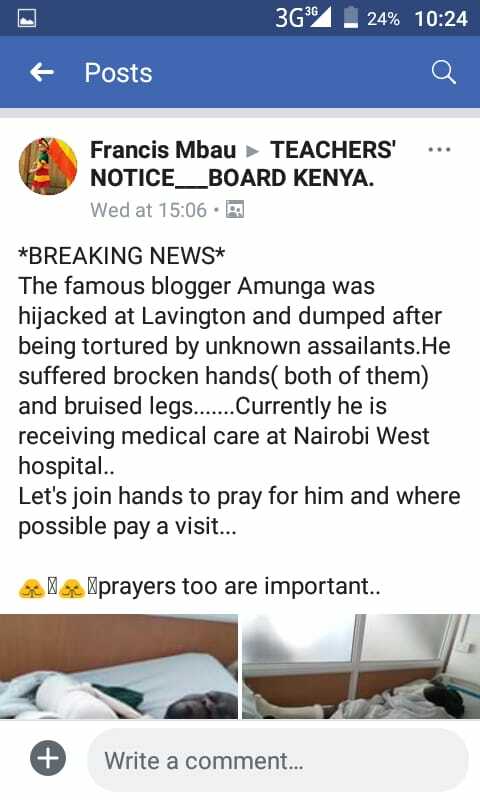 Popular education blogger Peter Amunga was on Tuesday afternoon around 2pm kidnapped while leaving the popular Lavington Mall, seriously assaulted by men who crushed his fingers and then dumped in Thika. According to people close to the blogger, he was kidnapped by men riding in a Toyota Fielder station wagon and Subaru cars which blocked the matatu he was boarding after meeting his friends at Lavington Mall. The kidnappers claimed that they were police officers and Amunga was under arrest for unspecified crimes. He was driven until Methodist Guest House where a hood was put on his head while the kidnappers continued assaulting him. According to Peter Amunga, he informed no one of his location. In fact, only KNUT Legal Officer Macharia Kabiru called him to ask where he was that he had not seen him for some time online. People close to him thinks that KNUT camps which are not happy with his postings might have been behind the kidnap. The kidnappers were well armed with guns, hammers and a mallets. They clearly had planned to kill him and only dumped him elsewhere after rethinking the move and kidnap situation. 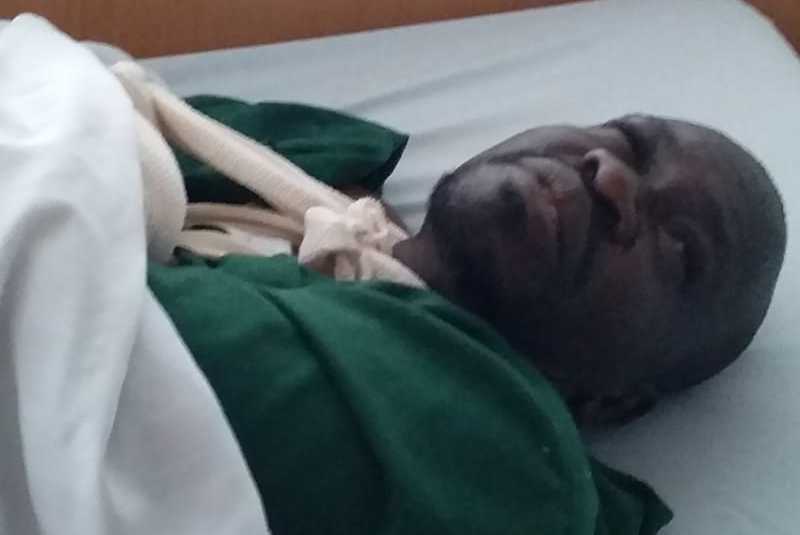 Now blogger Peter Amunga believes that his mobile service provider Safaricom might have allowed those who wanted to hurt him access to his phone location which was used to track him and eventually lead to his fingers being bludgeoned and some chopped off. The four men who kidnapped him from a matatu full of passengers clearly knew who they were looking for and shouted, “you are under arrest” while communicating with an afande or commander through a walkie talkie. 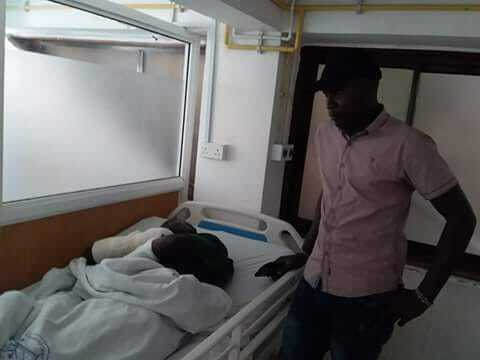 After getting dumped in a thicket near Thika, Peter Amunga was taken to Thika Level 5 Hospital where before he was even treated, KNUT delegates Peter Wanjohi and Francis Mbau had already known about the incident without being informed by anyone and they only insisted on taking photos and leaving. Peter Wanjohi left in a huff from the hospital after the hospital staff confronted him on his true intentions and interests. 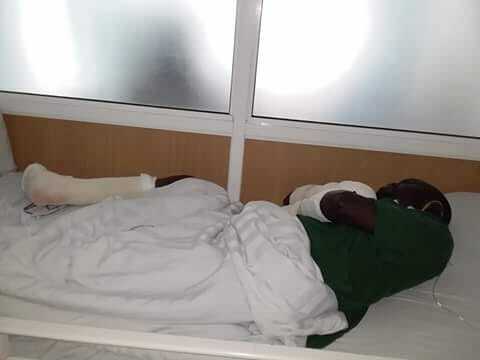 Peter Amunga was quickly put into an ambulance for a ride to a hospital in Nairobi. 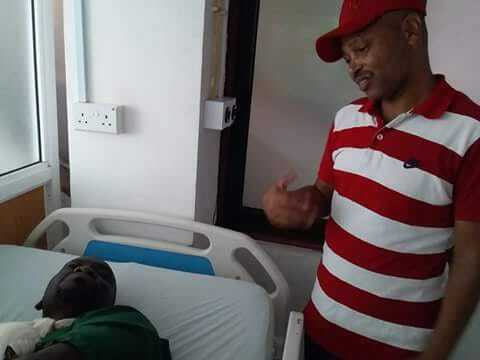 Before even being attended to at the hospital, Macharia Kabiru and Francis Mbau were again in the hospital with the sole interest of taking photos and posting it in various KNUT and teachers’ related WhatsApp groups and Facebook forums. Now Kenyan bloggers are demanding that police get to the bottom of this and have the suspects arrested as with mobile triangulation and communication profiling, all the suspects can easily be arrested and charged in a court of law. Safaricom and KNUT knows who really kidnapped and assaulted blogger Peter Amunga and for what reasons. The laking of subscriber data has led to assassinations and it seems like Safaricom is not interested in sorting this, once and for all. Safaricom should be held responsible for allowing criminals to easily access subscriber data and use the same to hurt or eventually kill them. According to Standard newspaper, Amunga was saved by feigning death, forcing the abductors to dump him in a thicket. Amunga reported the matter to Muthangari Police Station under OB number 54/11/10/2018 but is yet to get much help from the police. Peter Amunga has been greatly involved in the Kenya National Union of Teachers (KNUT) politics which is increasingly polarising as two camps have emerged to compete for the seat of Chairman. While one camp associated with current Secretary General Wilson Sossion is aligned to Sossion’s deputy Collin Oyuu, another is aligned to Patrick Karinga from Nyeri.